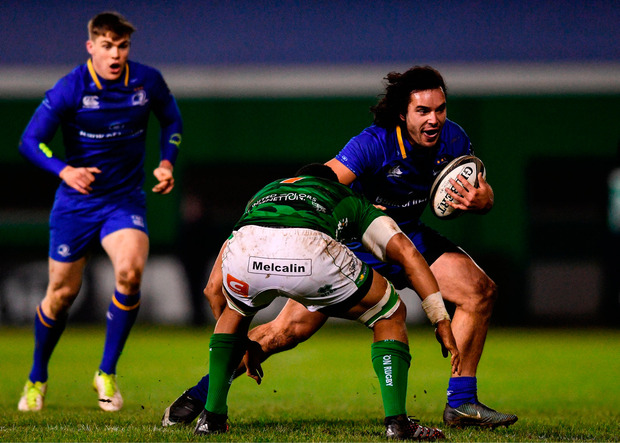 It's difficult not to get excited by James Lowe's Leinster debut and nine months after his move was announced the supporters finally got to see what the fuss was all about. With two tries and a powerful showing on the wing, it appears that Leo Cullen has a real gem on his hands. 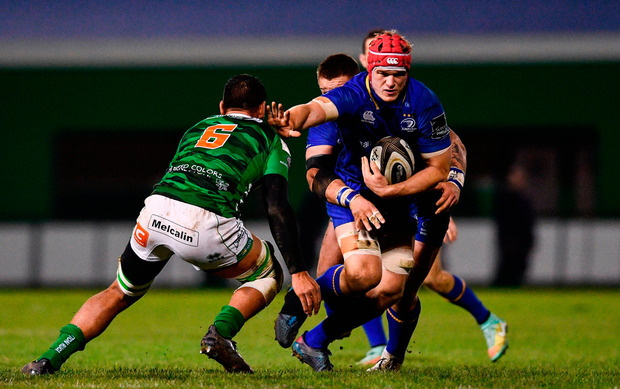 This game was wrapped up in the final quarter as Garry Ringrose, Lowe and Luke McGrath ran in the tries that clinched the bonus point and saw Leinster pull clear of their hosts. 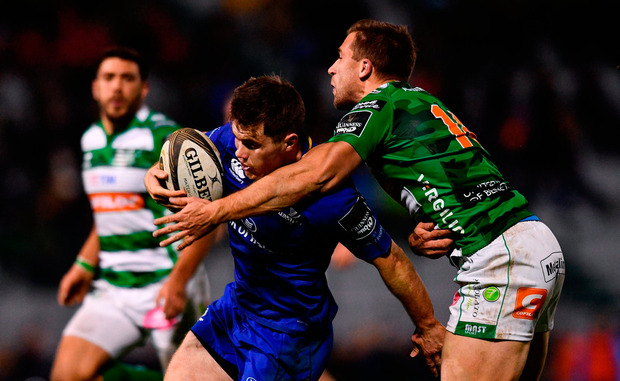 For the second week in a row Benetton worried an Irish province in their own backyard, but Leinster were far more ruthless than Ulster were in shaking them off their coattails. After such a fractured start to the season, with so many key players injured and away on international duty, it is some achievement from Leinster to be in such rude health. Ten points from 10 in Europe and second in their Guinness PRO14 conference, Cullen must be delighted with the options at his disposal ahead of a huge two months in both competitions. Ringrose was impressive as he played for the first time since he injured his shoulder during the summer and his try was the clincher. Josh van der Flier also did well following his ankle woes, while Lowe (below) shone brightly. The coach tried his best to dampen the excitement, but it was tough to mask his delight with his new winger ahead of Sunday's trip to Exeter. "He's a player that we admired from afar. He has credentials as a proven finisher, so it was nice to get off the mark for him today in what was his first cap," Cullen said of Lowe. "And to get through 80 minutes and get two tries as well, he did a lot of good things in the games as well. "We've tried to manage James reasonably sensibly since he arrived, because we are conscious he came off a very big season. It was good to get him up and running. "(Garry) has had to do a lot of work to get to this point, he has trained hard over the last number of months, so it's great to see him straight back in. He looked at home. It all adds to the depth as we enter into a huge block of games. "If you take the two Exeter games and then three inter-pros in 11 days and the final two pool games of Europe then as well: it's a huge block of seven games. It has been good to look at a few different combinations in the last few weeks and it will be a nice competitive environment next week." 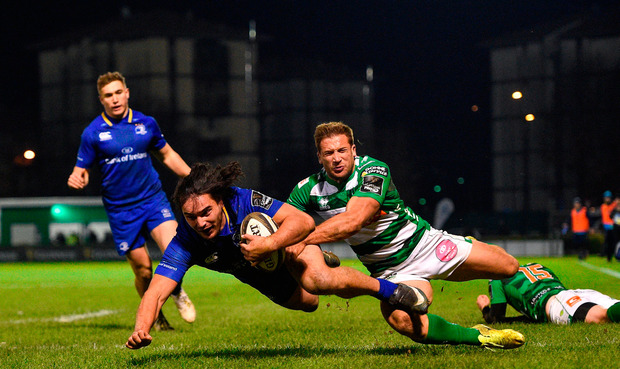 It took Lowe 17 minutes to get on the scoreboard, when Luke McGrath freed him down the blindside of a maul, while the scrum-half also sent Jordi Murphy through a gap for try number two seven minutes from half-time. 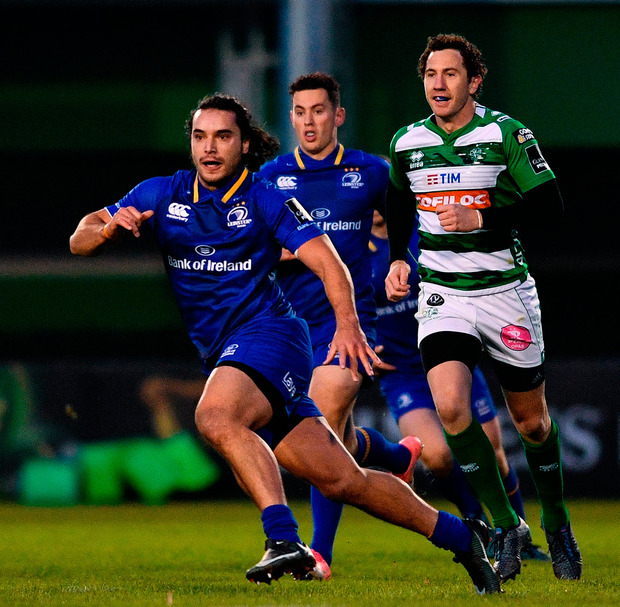 Ignacio Brex marked Benetton's best period of the game with a try after 57 minutes, but Ringrose, McGrath and Lowe responded well for Leinster, who earned their eighth league win of the season. It was far from perfect from Leinster, though. Their rolling maul misfired on a few occasions, and they didn't have it all their own way at the scrum either. However, they balanced all that out with another fine display from Ross Byrne at out-half, while Jordan Larmour looked very dangerous when he came into the line and linked with the No 10. There was also another debut off the bench for the academy tighthead Vakh Abdaladze. After consecutive bonus-point wins, it will be interesting to see which of the incumbents lose their places to the returning Irish internationals, but for sure Cullen is spoiled for choice in every position. However, he thinks that he'll need the competition. "You look across our pool, Montpellier were top of the Top 14 going in to this weekend, Exeter were top of the Premiership and Glasgow are 100pc, 10 from 10, in the PRO14. That's how tough our pool is," he said. "Sandy Park is a very tough place, it's become a real fortress in English Rugby, they are the Premiership champions and these are going to be two huge weeks for us." Benetton: M Banks; T Benvenuti, I Brex, A Sgarbi (capt) (L Morisi 72), L Sperandio; T Allan, G Bronzini (E Gori 46); C Traore (N Quaglio half-time), T Baravelle (H Faiva 46), T Pasquali (A De Marchi 66); A Zanni (M Lazzaroni 62), I Herbst (F Ruzza 46); W Douglas, N Manu (S Negri 49), R Barbieri. Leinster: J Larmour; D Kearney (F McFadden 61), G Ringrose, N Reid, J Lowe (R O'Loughlin 75); R Byrne; L McGrath (capt) (N McCarthy 65); J McGrath (E Byrne 58), J Tracy (S Cronin 58), A Porter (V Abdaladze 70); I Nagle (M Kearney 58), S Fardy; Jordi Murphy, J van der Flier (M Deegan 70), J Conan. Ref - D Wilkinson (IRFU).